You know that golden, dripping stuff you dip lobster into? That’s clarified butter. You obtain it by heating butter until it separates into two parts: liquid butterfat and the milk solids that float to the top. Skim the milk solids off and viola, you’ve got clarified butter. To obtain ghee, let the clarified butter cook a bit longer. Because the few remaining milk solids caramelize and more moisture evaporates, ghee has an incredible nutty flavor. It also has a longer shelf life than butter or clarified butter and can actually last for years without refrigeration. 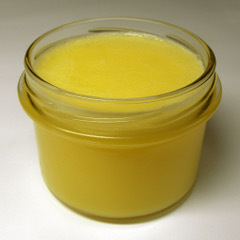 Ghee is great for cooking because it is very stable cooking fat. It can be heated to 485 degrees before it starts to burn. That makes it great for pan-frying and cooking at high heat. It also happens to be a staple in Indian and Thai cooking because it holds up well to strong spices, which makes it ideal for curries, sauces and other slow-cooking dishes. In addition, heating ghee seems to produce much less of the toxic compound acrylamide that is produced when heating vegetable and seed oils. Finally, while ghee can be substituted for butter in a 1 for 1 ratio, butter is sweeter, so it may be better to use in baking. Since the milk solids are skimmed away, ghee has virtually no dairy protein, and that means people who are sensitive to dairy can usually eat it with no problems. There is such a thing as vegetable ghee also known as vanaspati ghee and it may be contributing to the rising heart disease rate in Indian and Pakistan. Ghee doesn’t seem to affect LDL “bad” cholesterol levels much, although folks whose LDL increases in response to high saturated fats may want to limit their intake of ghee. At this point, there’s no evidence to suggest that ghee is better in your diet than butter. As long as you aren’t allergic to diary proteins, butter and ghee can both be consumed in moderate amounts in a healthy diet.